Muttis sells hot pretzels and beer. They also make fantastic Austrian food. They rock! Muttis is one of my favourite restaurants at the moment. However, despite their total awesomeness, they don't seem to be that busy. The first time we went (a Saturday night in June last year), the restaurant area at the back was about three quarters full, whilst the smaller area at the front was just bar space. This time, (again, a Saturday night) the back section was empty, and diners were seated in the smaller front section. From memory there were about 5 tables (including ours) all night. WTF!! Come on Melbournians! I should say, us 5 tables weren't the only customers; there was a birthday party upstairs as well. Still, it seemed pretty quiet for a Saturday night! I really hope it was just a once off! We went to Muttis a few weeks ago with our friends Wes & Amanda (or as I like to call them, "Wemanda"), who wanted to try out a nice new restaurant. 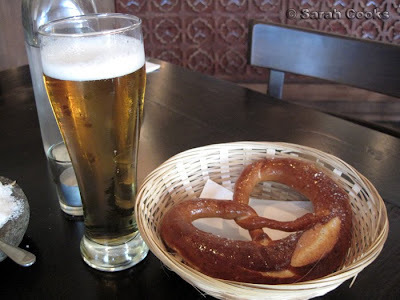 We got there a bit earlier than them, so had some beer and savoury pretzel to start with. The little tap with the wooden heart is Muttis Milk, the house brew! The entrees always sound tempting, but knowing how big the mains are, I have yet to try any. They've also changed up the menu quite a bit since last time, so I have some new dishes to show y'all! 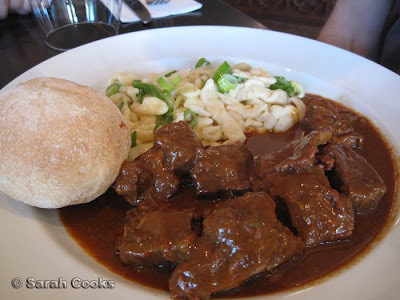 They seem to have changed their spätzle since last time - it had sliced spring onion rather than chives. Amanda ordered the chicken dish. How good does it look! 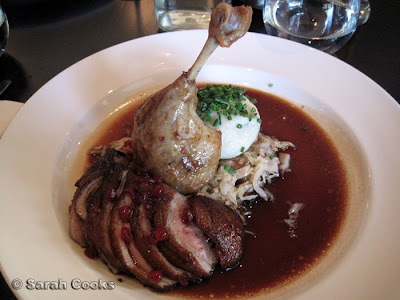 I was suffering some serious dish-envy, but couldn't go past the devilishly decadent triple duck. 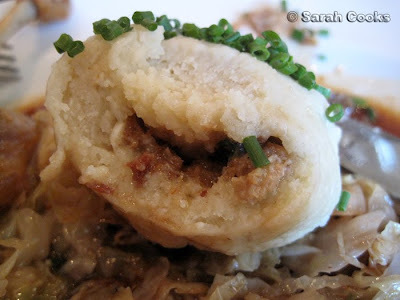 Although the dumpling looks small, I thought it was quite enough carby goodness to soak up the sauce. Not so much the gentleman diner at our next table - he ordered a hot pretzel to help him along. Great idea, huh? No entrees means there is room for dessert! Sandra ordered another savoury pretzel for her 'dessert'. Muttis does, indeed, have a sweet pretzel on their dessert menu, but according to Germans, sweet pretzels are just a bit wrong. 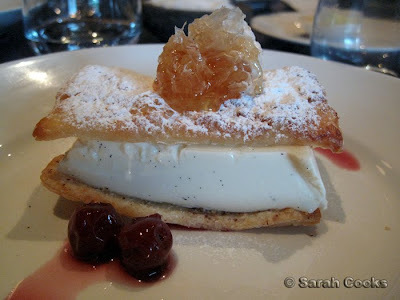 Muttis' version was a gelatin-set vanilla custard between 2 sheets of puff pastry. Kinda like a mille feuille, I guess! This one, unfortunately, wasn't that great. Whilst the custard was smooth and creamy, the pastry was a bit stale and unpleasant. Oh well! 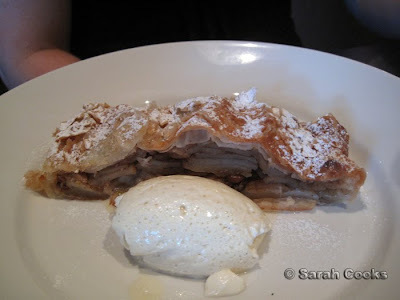 Amanda ordered the classic apple strudel. 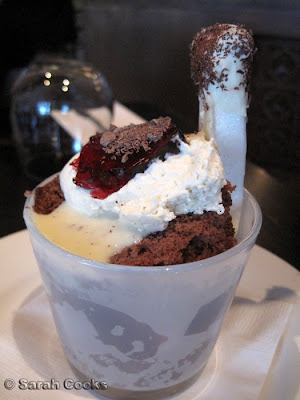 And Wes had the Black Forest trifle. Wes told me he doesn't normally like trifle, but I like to think that my passionfruit trifle has helped to change his mind, hehe. That tall white thing that looks like a marshmallow was actually a meringue. 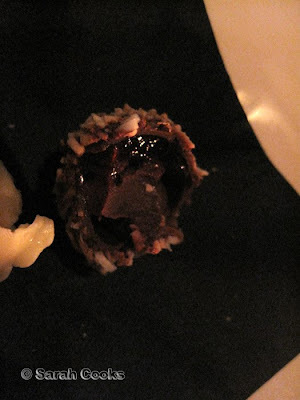 The whole dessert was a very cute idea, and I think the choc-cherry combination is a total winner. Overall we had a great night, and despite the slight disappointment with my dessert, were full and happy. I really like Muttis, and I hope it stays around for a good long time. It definitely deserves to! A while ago, I received some pearl couscous to test - it's the blue box with Gabriel Gaté on the front. Even though it came with some Gabriel-designed recipes, none of them really caught my eye. Lucky then, that at about the same time, David Lebovitz posted a recipe for Israeli Couscous with Butternut Squash and Preserved Lemons on his blog. I love those hearty meal-in-a-bowl type salads - chickpeas, brown rice, some dried fruit, herbs, whatever. 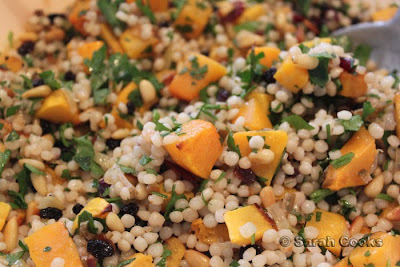 David's salad contains the couscous (duh), cooked onions, golden raisins, roasted squash, preserved lemons, parsley and toasted pine nuts. How good does that sound? 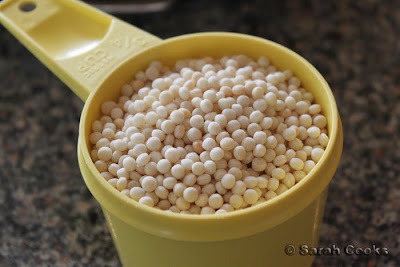 As you can see, the pearl couscous is larger than regular couscous, but also smaller than mograbieh. 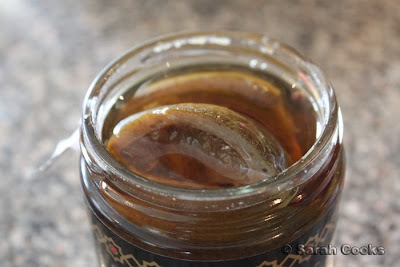 I didn't have any preserved lemons, that oh-so-2007 ingredient, but I did have a jar of preserved limes in the pantry. I'd never cooked with them before, and was surprised to find that they smelled super-strong, like chlorox. *Cough cough*. I was a little worried using them, so I halved the amount the recipe asked for, and chopped them up into teensy-weensy pieces. Please note knife of awesomeness, bought at Kappabashi-Kitchen-Town. 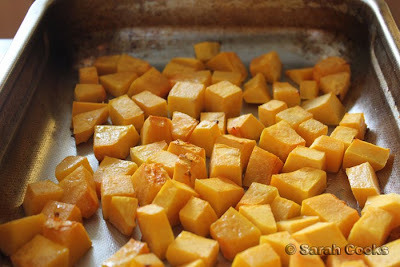 You also have to chop up and roast the butternut squash. 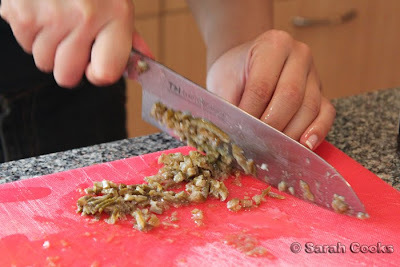 Then it is just a matter of chopping and stirring everything together. I didn't have any golden raisins, so substituted currants and cranberries - still good. The salad was a lot of work, what with all the separate chopping and roasting and toasting and everything, but it was worth it! It was very tasty and light, and lasted for lunches over a few days. The preserved limes, while strong, weren't overpowering. The couscous is bland, and soaks up strong flavours really well. As for the couscous itself, I thought it was great! I liked how it kept its shape and didn't go soggy or blurry at the edges. It's a great carrier for dressings and sauces. If I were to use it as an accompaniment for a stew, I'd make sure to dress it with lots of butter or olive oil, some salt and possibly some chopped chives. 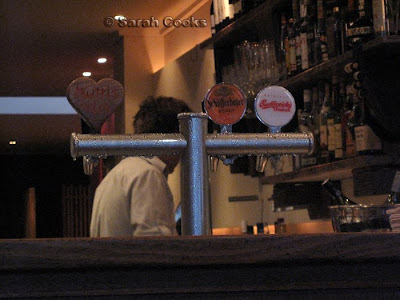 Have you noticed zeitgeisty the Melbourne blogosphere can be? Bloggers get excited about the latest cool place, a zillion posts and tweets come up, and eventually we move on and the excitement dies down. (Of course, the actual cafes and restaurants still keep keeping on, long after the cameras and iPhones have been put away). Recent examples that come to mind are Seven Seeds, Proud Mary and Cutler & Co.
Kent Brockman: Excuse me, did you see the six o'clock news? Comic Book Guy: No, I get my news from the internet, like a normal person under seventy. Farewell, dinosaur. But, it's not as if every single restaurant and cafe out there gets blogged. Personally, I usually don't blog my absolute favourite, most visited places. Not just because I don't want my legions of readers and fans cramping my style (haha! 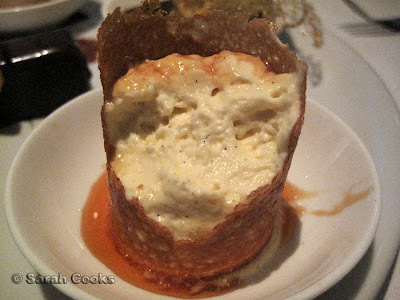 ), but also because I visit my regular haunts too regularly to bother blogging them. I'm not sure if other bloggers are the same as me, but if so, this means there must be heaps of unblogged gems all over Melbourne. And how hard is it to keep up with all the Melbourne food blogs, anyway? So, blogs, twitter and other media of the young-and-trendy may be the place to hear about the newest trends and latest coffee temples, but let's not discount the good old tree media. However, one of the good finds was Zimt Patisserie Bakery Cafe. I haven't seen anyone blog about it yet (although please send me a link if there are any other posts about it!). It's an Austrian bakery, in the Eastern suburbs. YAY! We visited on a quiet sunny weekend, a few weeks after the Christmas break. It is quite a small cafe, with some outdoor seating, and judging by our visit, is primarily frequented by middle-aged ladies. 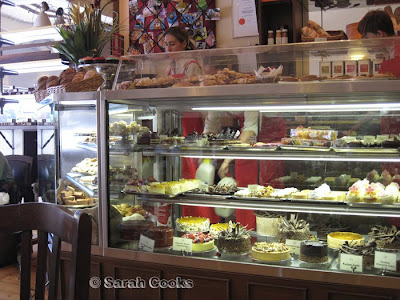 They have quite a wide range of baked goods on offer, from bread, to streusel slice, chocolate cakes, biscuits and more. They seem to do a lot of Christmas baking too, including stollen. I started off with a latte. It was decent, not great, but pretty much what you would expect from a suburban cafe. I had a walnut crescent, which was quite nice, but I suspect that these are best enjoyed straight out of the oven. Hehe, I thought the pudgy shape was cute. Maybe they could do with a Kipferl flexi-form! 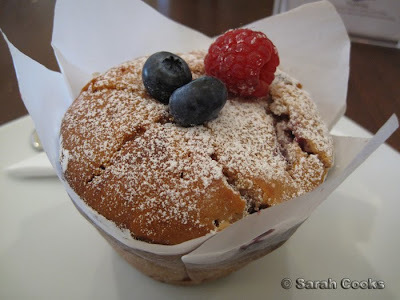 Sandra had a mixed-berry muffin, which by all accounts was very good, and full of juicy fruit. On our way out, we bought a loaf of bread, and I impulsively bought a lemon tart and mini cheesecake to take home. Looking at the array, I was curious and asked the sales assistant about the tarts. She said they were lemon tarts, filled with raspberry preserve, and the filling was the same as what they use in the cheesecake. OMG. Sarah: I'll take one of each please. How cute is the mini-cheesecake? I tried cutting it in half to share, but the base was rock hard. I couldn't cut it with a fork; I needed a sharp knife to cut all the way through. So when I ate my half, I basically ate all the cream first, then picked up the base and ate it separately. The cream itself was fantastic - light and creamy, not too dense - and the biscuit base had a strong nutmeg taste, much like spekulatius. Much more impressive was the lemon tart. The pastry (phew!) 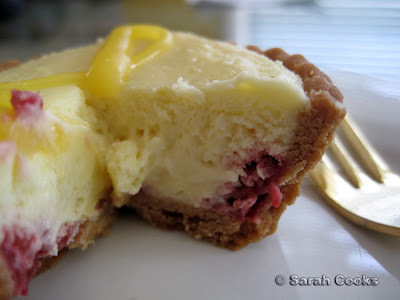 was crisp and light (not ri-donk-ulously hard like the cheesecake base), the soft cheesecake cream was a fabulous filling, and the raspberries and lemon curd gave a sharp contrast. Wow. 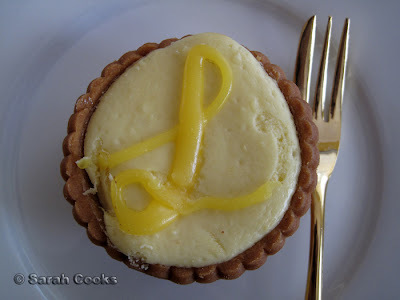 My favourite lemon tart, ever! 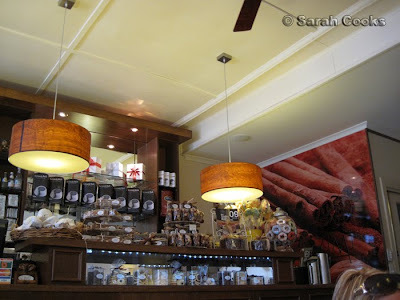 So, a big thank-you to the Foodies' Guide for recommending this great cafe! 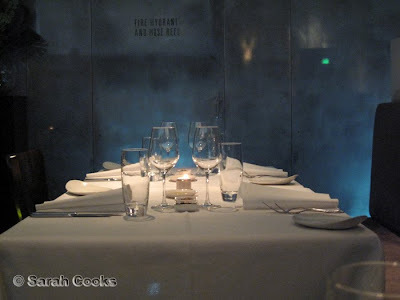 2 weeks ago we went to Ezard to celebrate my changing jobs. (Yaaaay!) 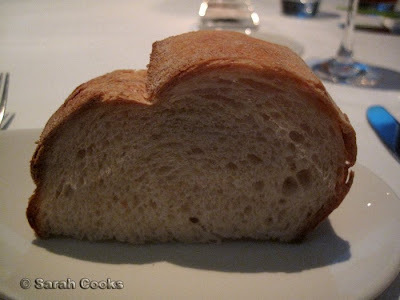 Despite being a consistent 2-hatter, I haven't read much about Ezard around the blogoshpere. 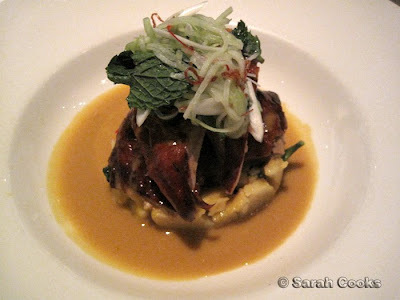 In fact, I think Melbourne bloggers are more familiar with Teage Ezard's more casual eatery, Gingerboy. 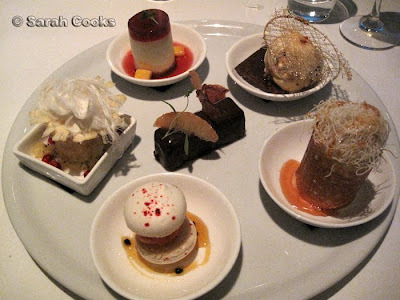 Ezard, on the other hand, is a properly fancy restaurant - tablecloths, nice glassware, deferential staff in sharp suits. The space is quite long and narrow, with muted lighting and funky grey walls (see above). The tables against the wall have couches. (Or is banquette the right word?) Either way, we happened to get a corner table, so we both got to sit on banquettes. Score! If you've seen any of Teage's recipes before, you'll know they're incredibly detailed. Pages of ingredients, lengthy and complicated processes, and in some cases, days of preparation are required to achieve the final, beautiful, complex result. With this in mind, I was prepared for some sophisticated food, but still was blown away by the flavour combinations and the thought put into each and every dish. Apologies if I've gotten any of these wrong, or missed out on certain ingredients - lots of the dishes aren't on the online menu, and I was too embarassed to start writing things down. (I did save a few things into my phone though, heheh). 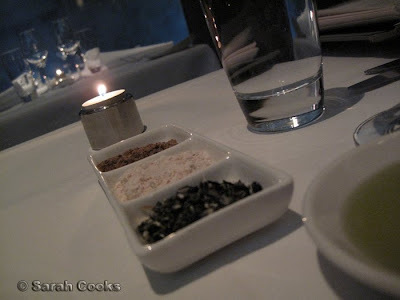 Each table is provided with a selection of salts and spices for dipping. From top: Szechuan pepper prickly ash; Chinese yellow rock sugar and chilli; Bonito with Szechuan pepper and wakame. The Szechuan pepper prickly ash was quite strong and smoky, definitely best in small doses. The oil provided was Ezard's own blend - olive oil infused with garlic, parmesan and rosemary. It was so delicious we bought a bottle to take home! 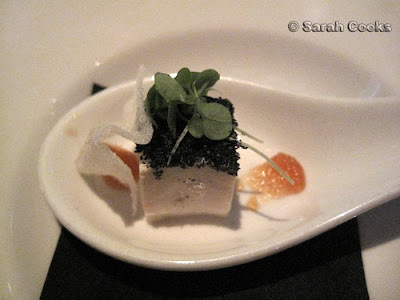 Before our entrees, a little amuse bouche came out - black sesame crusted smoked tofu with a soy mirin gel. I had a little taste of the tortelli, and it was rather fabulous. 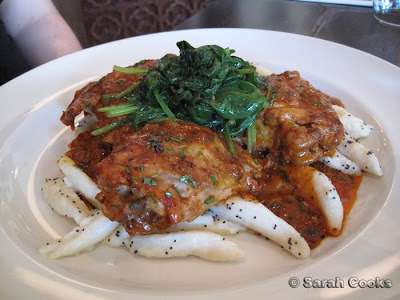 In addition to the deep mushroom taste, the spinach had a charred-wok flavour. 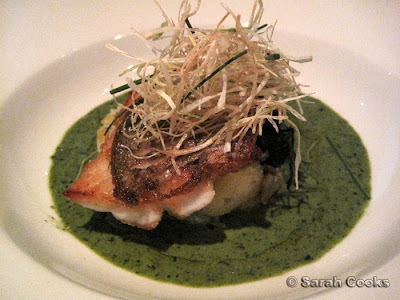 The flavours and textures worked really well together, especially with the fresh herbs on top. 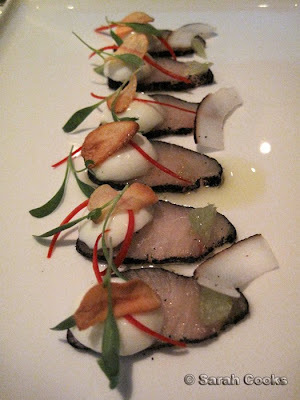 I ordered the kingfish sashimi, which was super-fresh and gorgeously presented. 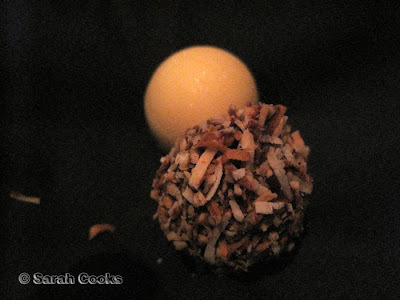 I especially liked the little curls of coconut, as they reminded me of Vanuatu! The chicken here was slightly gamey, almost like duck, and was very tender. Underneath, the potatoes were soft, and soaked up the rich curry sauce deliciously, whilst the fresh salad on the top was both crunchy and sour, lightening the overall dish. Wonderful. For myself, I again chose seafood, with fried snapper. 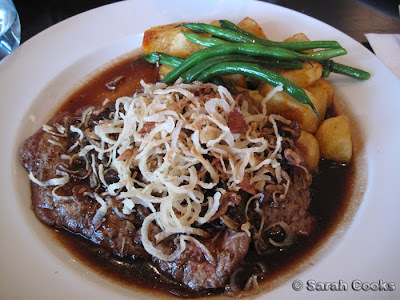 I had a little trouble deciding on a main dish, but chose this one in the end because it had fresh broadbeans! I absolutely love broadbeans but can never be bothered shelling them myself. One thing I've learned about myself over the years is that I always find restaurant desserts too sweet, too big and too rich. 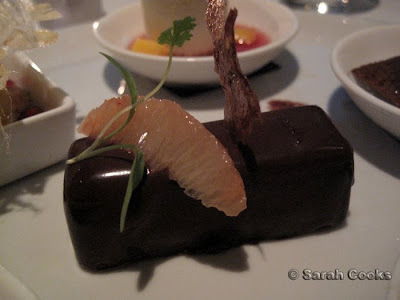 And you're stuffed if you end up not liking your dessert (*ahem* Bistro Guillaume *ahem*). So if we are doing dessert, we almost always go for a platter to share between 2. I had a glass of sauternes with dessert. I forget the exact name of the wine, but if you visit it's the only one on the menu available by the glass! It was amazing. Sauternes, where have you been all my life? I can't remember exactly what this one is (our waiter explained all of them to us as she brought the plate over - I nodded and smiled, it was too much to remember! 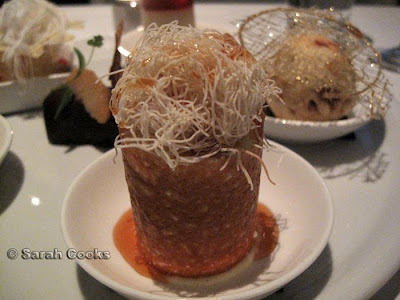 ), but it was topped with kataifi, had a brandy-snap-type crunchy shell, and a vanilla-flecked moussy cream on the inside. 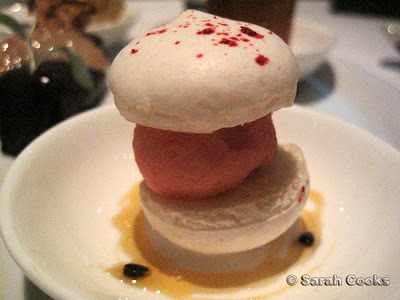 Macaron with raspberry sorbet, and passionfruit. Cute, huh? 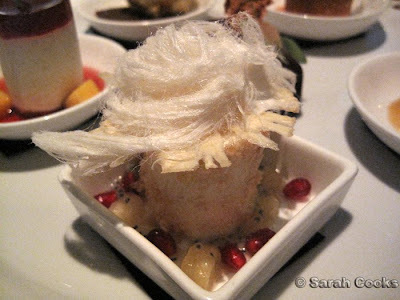 The sorbet was intensely fruity, and the crunchy meringue provided a pleasing textural contrast. I certainly wouldn't call them macarons though - they were crunchy all the way through. Pina colada parfait, coconut praline, honey and black basil seed pearls. 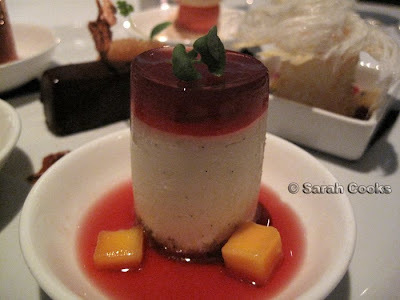 Below we have a fromage frais cheesecake, chilled strawberry soup and cubes of mango. Apparently when our waiter was listing the desserts, I was just nodding and smiling politely, until she uttered the words "fromage frais cheesecake". At this point I exclaimed "Ooh cheesecake!". All class. Anyhoo, it was, as expected, fantastic. 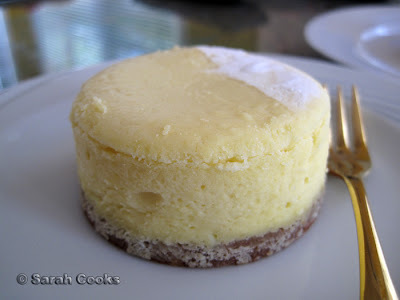 I hadn't had fromage frais before, and I found the finished cheesecake was quite similar to regular cheesecake, but with a less-fatty mouthfeel, and not as sour as cream-cheese based ones. 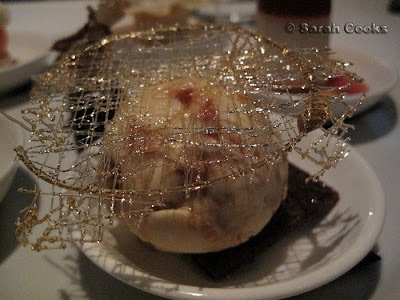 The sugar-crowned orb we see below was five spiced honeycrunch ice-cream with toasted gingerbread. Even the crunchy caramel seemed to have a strong ginger taste. The result of days and days of work and preparation and infusing, no doubt. I love gingerbread (and spekulatius and those Swedish ginger almond cookies they give you at Kikki K....), so no surprise that I loved this dessert! With the crunchy sliver of gingerbread, I thought of it as a Christmas-spiced ice-cream sundae. And finally, we have that devil in the centre, the chocolate marquise. The green sprig you see on top of the bar was actually young coriander! (The same as is served with burrata at Tutto Bene). The bar was malevolently dark, with a rich, almost buttery filling. For dark chocolate lovers only! Looks like a Mars bar inside, does not taste like a Mars bar inside. 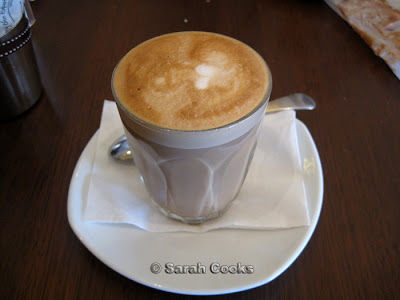 By this stage I was well and truly full, but still wanted a little coffee to finish the meal. Coffee is $6.50 (!!!! 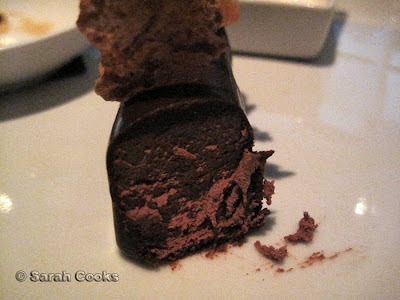 ), but you do get these funky chocolate truffles as well. The total bill came up to $262 for 2, which included a $30 bottle of olive oil and a couple of drinks. One day, when I am grown up and sophisticated (hah!) I will order wine by the bottle, but for now I am happy with just a glass during the meal. We couldn't find any fault with the service: from making the reservations, to taking our orders, to the pacing of the meals. 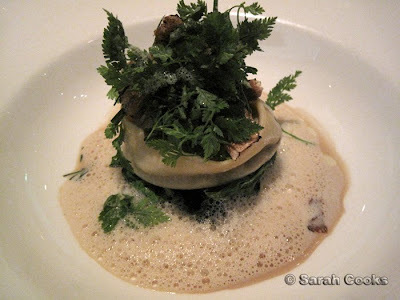 Ezard is a fantastic restaurant for a special occasion, and I can't wait to come back. 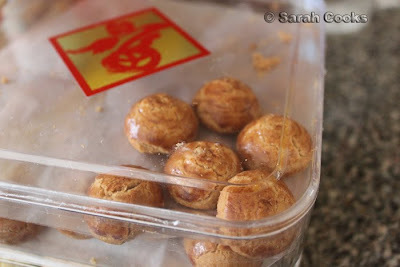 Peanut cookies, brought back from Malaysia by my brother. 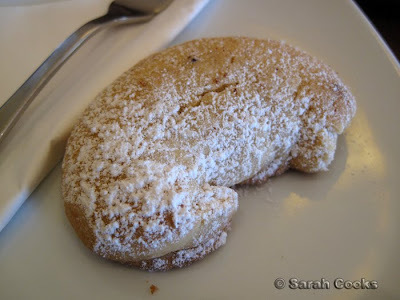 I have been inhaling these powdery peanut cookies over the last week. 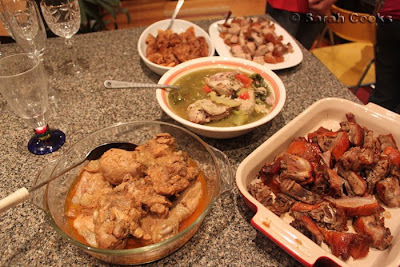 My mum actually did all the cooking, apart from one dish that my cousin Gina brought (see below). Our Chinese New Year reunion dinners are pretty much the same every year, and is made up of Malaysian Nyonya-type food. This year, in addition to the usual kiam chye th'ng, loh bak and chicken curry kapitan, my dad bought roast duck and roast pork from the local Hong-Kong BBQ place. When we reheated the pork in the oven it got a little dry. Maybe next year I'll try making it myself! 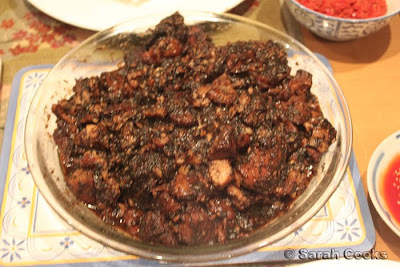 Close up of the Loh Bak. 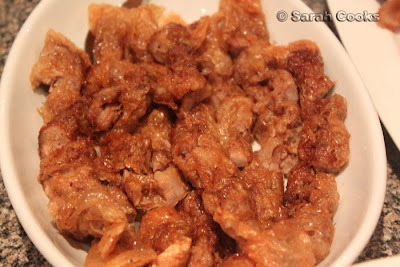 Pork Shoulder cooked with fatt choy (lucky moss) - made by my cousin Gina! 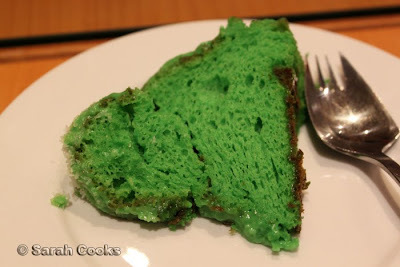 For dessert, we made Thanh's amazing pandan chiffon cake with pandan fudge icing. 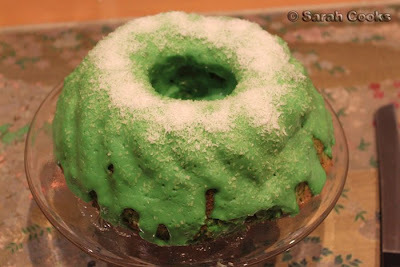 I don't have a full-sized chiffon cake, so made it in a bundt pan. I love how fluro green it looks! 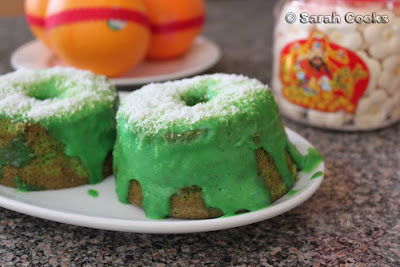 One of the amazing things about this cake is how super-duper moist it is. We left the remainders sitting on the bench overnight (uncovered), and this morning it still tasted fluffy and moist. Great recipe, Thanh! Of course, if it's New Year, then there must be New Year biscuits. My bro brought back a copule of boxes from Malaysia - the incredible peanut cookies you see at the top of this post, and these pineapple jam biscuits here. I'm not a huge fan of the pineapple jam ones, but I am absolutely addicted to the peanut ones! 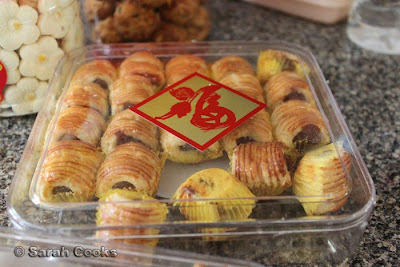 I also love the kuih bangkit - they're the flower-shaped white cookies you see in the background. These biscuits totally remind me of Penang - they are made of tapioca flour, pandan, sugar and coconut milk. They are very powdery and melt in your mouth. Behind the kuih bangkit are some cornflake cookies that my cousin brought - not traditionally Chinese New Year, but delicious and addictive!